Anyone who follows me on Instagram/has ever spoken to me for even the shortest amount of time could probably confirm I'm a cat person through and through. 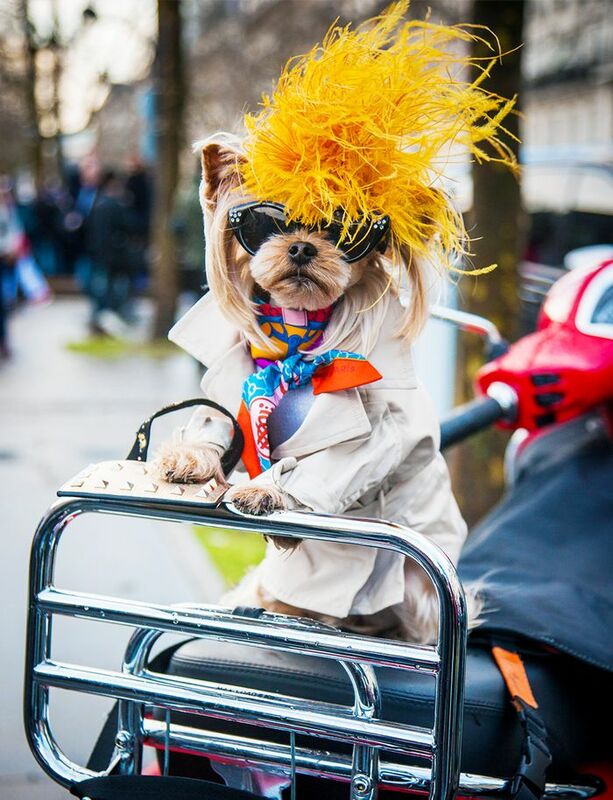 But upon seeing a stream of images of a rather fabulous looking little dog in sunglasses, tulle dresses and posh bouclé jackets posing up a street style storm, I was entirely sidetracked from my emails one day during Paris Fashion Week. Who was this mysterious fluffy creature? Where did it get such wonderful designer-style clothes from? How does it know to sit outside a Parisian café with such grace? Was there really a dedicated collection for animals at Chanel or Giambattista Valli that I never knew about? Fashion week stars were clamouring to get a shot—my interest was suitably piqued. Introducing Little Lola Sunshine: The Chicago-based Yorkshire Terrier with impeccable taste, a strong social media fanbase (25.2K Insta followers and counting), designers flocking to work with her and a "day job" as a therapy dog, helping entertain poorly children in hospitals, for example, or as a reading assistance dog in underserved inner-city schools. In the age of the polymath, it turns out this one little lady is quite the trailblazer. We caught up with Lola, and her owner, Caron, in between their busy PFW schedule to learn more. Lola is particularly into feathers this spring. When did Lola first start dressing up, and how did that happen? Never in a million years did I think I would dress up my dog. Lola was about 6 months old when I casually mentioned to a young woman, Krista, that I wanted to train Lola to do tricks for children in hospitals. Her response was, "Do you know my Dad is a dog trainer?” I did not. Krista’s father is probably one of the most accomplished dog trainers in the world, and she is also a gifted dog trainer. With that, Krista and her father agreed to train me and work with Lola. It was serendipity! It all began in early 2014. I spent my mornings for the next year and a half teaching and working with my dog and learning a language that belongs uniquely to Lola and me. I taught small behaviors, adding them up and turning them into big tricks. One cold winter day, I put a sweater on Lola and took her to Shriners Hospital for Children. The kids absolutely loved her. A frou-frou dog in a pink sweater handing out balloons to the kids in wheelchairs and rolled in hospital beds doing amazing tricks? It made them so happy; we left them smiling, and I knew this was the start of something amazing. From that day on, it was a hospital request that Lola was to always arrive in clothing. Lola also works for literacy in underserved inner-city schools as a reading assistance dog. When the dogs go into the classroom, the kids are so enthusiastic. All of the children love Lola. Most of the children love the clothes. Some children think that the clothes are a bit silly, but every child gets excited to write and express their opinion. Dogs help kids read. A dog in clothes gives them something funny to write about. The best part is that practice makes perfect and literacy lasts a lifetime. And so, dog clothes became part of Lola’s life. Wearing Andrew Gn for the designer's show in Paris. When did you first start documenting that on Instagram? Lola’s Instagram was created about four years ago. We set out to build a following of people that cared about Lola and her therapy work. If a few followers step up to the plate when Lola’s children need books and pencils or donations for medical equipment or food, we have succeeded. When we raise awareness for our charities, that is good. Instagram has enabled us to fundraise for organizations close to our hearts: Feeding America, Shriners Hospitals and SitStayRead. We have let so many people know that with a little training, therapy work is not out of reach for their dog and will make such a difference to so many. Every dog can make a difference, and paying it forward feels so good. Paying homage to the Insta-famous Saint Laurent heart coat—as favoured by the likes of Rihanna and Kendall Jenner. Do you always travel for fashion week? We are from Chicago, and that is our home base, but Paris is our happy place and we have gypsy souls—have dog, must travel. 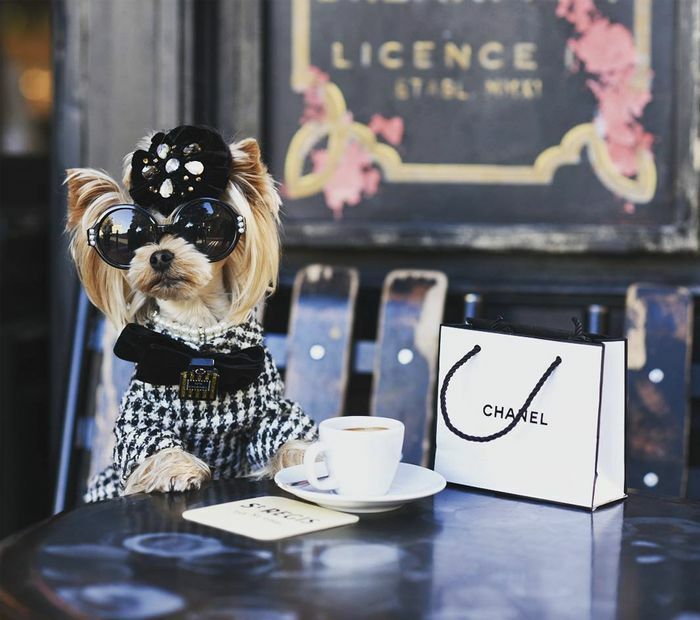 Lola startedtravellingg for fashion week about three years ago when she made her first appearance in a simple black-and-white dog sweater at the Grand Palais doing a few tricks at Chanel. It just grew from there. Fashion week for us is about so much more than the clothing. We do flash performances and therapy work on street corners and in parks around the world. We do a few minutes of tricks, share a little love and disappear. It’s just amazing to see peoples’ faces light up when they see Lola move; she just leaves them smiling. The thing we hear most is “Lola, you just made my day.” It’s all the reason in the world to keep going. Relaxing after the Giambattista Valli show. Where do you get Lola's clothes, or do you make them all? Lola’s clothes for fashion week are custom made for her. We work with some very talented people who understand our vision and purpose and were lucky to find them. To complement her looks, we often add actual designer accessories. Maybe we should take a leaf out of Anna Dello Russo's book and have a mini auction to benefit a charity? How would you describe her look, and how does she keep on top of the trends? There are fashion details that are just very Lola. Right now, Lola is wearing a lot of feathers. A Lola look is happy and bright fashion. Just add a bow! Lola’s clothes are human runway looks resized and simplified for a dog. Sometimes the look is a hit, and sometimes it’s a “fashion faux paw” never to be put on again. We go with what we like, who we like and how we feel. It’s all about personal style. What has been Lola's biggest fashion moment so far? That is a hard question. Probably, our best memory was Lola’s very first experience at fashion week—Chanel, Grand Palais, March 2015. We didn’t know what to expect, but the response from the press and people watching was beyond our wildest dreams. Everyone was calling “Lola, Lola, Lola!” It was so much fun, and it was the first time I truly felt support for Lola in-person and on Instagram. It made me realise that the fashion gig as a supporting role wasn’t so crazy after all. Getting snapped with the Amiaya twins for the street style photographers in Paris. How do you know Lola is happy to do this, and what would you say to anyone who might be concerned about using a dog in this way? I don’t “use” Lola. We are Team Lola. I believe our relationship is about the highest level a human/dog connection can go. We have a language. She is with me always. I teach her, and she loves the praise, play and attention that comes with it. We have a bond of trust so she knows to look to me for commands when she is unsure of what to do. Her trust brings a responsibility to me being her advocate. And ultimately, she is the boss. When she tells me she is done, we’re done. Sometimes during practice while working through a trick or a series of obedience movements, Lola totally knows when she gets it right. She jumps, wiggles and kisses. It’s her way of saying “I understood and I did it. Yay!” She also has another little signal in public. It’s a quick little nose nudge in the calf when she is at heel. It’s her unique way telling me that she is in place and ready to rock. She will also do this when she is fancy heeling. She jumps and pokes me in the upper thigh at the top of her jump as if to say “look how high.” It’s Lola’s version of a great big smile. Dogs are the only animals that have attached themselves to man. They thrive on having a purpose and a human to be with. Some dogs herd, some track, some protect, some guide, but it takes time and love and effort to teach a dog. Not every dog can or should work. There are people that see Lola at fashion week and make assumptions. All they see is a dog in clothes, sitting and balancing a pair of sunglasses for the cameras. It’s terribly sad that they make assumptions and judgments without knowing anything about us and what we do. Our next stop after fashion week is March for Our Lives in Washington, D.C. Lola is very concerned for kids and their welfare. We are going to turn out and broadcast our support. She will, of course, be dressed appropriately. The full Giambattista Valli-inspired tulle dress. Are there certain brands, stores or publications that are particularly keen to work with Lola? And anything exciting in the pipeline? Lola has done commercials for pet brands, pharmaceutical companies, American Express and Chase Bank. And, I don’t want to jinx it, but there is something exciting in the works that might bring the fashion brands… You will be among the first to know! Until then, we are going to just keep doing our thing and completely enjoy it.